Frank Allcroft, a television news anchor in his hometown (where he reports on hard-hitting events, like the opening of canine gyms for overweight pets), is on the verge of a mid-life crisis. Beneath his famously corny on-screen persona, Frank is haunted by loss: the mysterious hit-and-run that killed his predecessor and friend, Phil, and the ongoing demolition of his architect father's monumental postwar buildings. And then there are the things he can't seem to lose, no matter how hard he tries: his home, for one, on the market for years; and the nagging sense that he will never quite be the son his mother—newly ensconced in an assisted-living center—wanted. As Frank uncovers the shocking truth behind Phil's death, and comes to terms with his domineering father's legacy, it is his beloved young daughter, Mo, who points him toward the future. Funny and touching, The News Where You Are is a moving exploration of what we do and don't leave behind, proving once more that Catherine O'Flynn's writing "shimmers with dark brilliance" (Chicago Tribune). The News Where You Are is a 2011 Edgar Award Nominee for Best Paperback Original. 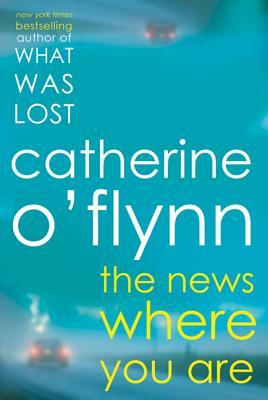 Catherine O’Flynn is the author of the bestselling debut novel, What Was Lost, which won the Costa First Novel Award in 2007, was short-listed for The Guardian First Book Award, and was long-listed for the Booker Prize and the Orange Prize. Her second novel, The News Where You Are was an Indie Next List selection and was shortlisted for the 2011 Edgar Award for Best Paperback Original. She lives in Birmingham, England.